One of the more obscure makes we’ve come across, the rather handsome cars featured here today in one way represent hundreds of other makes that came and went in a relatively short time in the pre-war era. Starting out in Spencerville, Indiana in 1874 as a manufacturer of windmills and horse-drawn vehicles, the Zimmerman brothers, Frank and Elias, moved the company to Auburn in the 1880’s. Beginning in 1907, they produced a solid tire high wheeler, but rapidly moved on to more conventional four and six cylinder cars in the ensuing years. 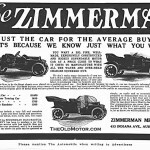 L to R – A 1911 Zimmerman Model “Z” Touring Car – An ad with some curious, catchy wording – A 55 horsepower 1913-14 “Zimmerman Six” with a very rakish cowl design. 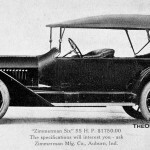 From 1911 onward, the company did not maintain it’s own production facility, but instead contracted with the Auburn Automobile Company to build their cars under both the Zimmerman and De Soto names. After Frank died in 1910, Elias, then aged 80, retired from the business. Evidently, the company had continued building horse-drawn conveyances concurrent with their automobiles and did so until 1918, even after car production ceased. Zimmerman appears to be a rare case of an enterprise going from horse-drawn vehicles into motorcar production and then back to buggy building before fading away. You’ll find many more pages about the earliest days of motoring and Auburns on The Old Motor. Photos courtesy of Alden Jewel. 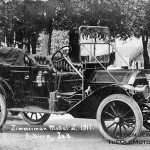 This entry was posted in Auto photos 1885 - 1920 and tagged 1911 Zimmerman, Auburn Automobile Company, DeSoto, Elias Zimmerman, Frank Zimmerman, Zimmerman Six. 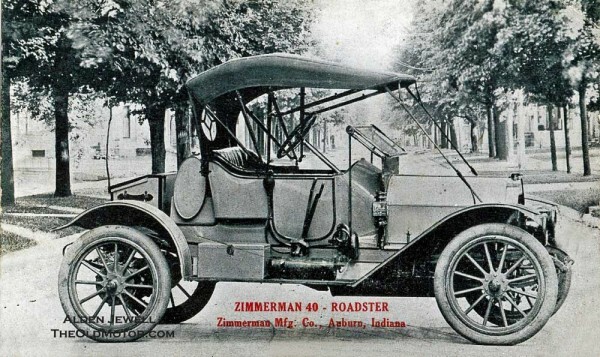 It’s nice to see some examples of the Zimmerman cars after 1910. They seem to be quite rare. The question is of course what was specific Zimmerman on these cars. The car itself could be easily mistaken for an Auburn, though the 1913 Six has some minor differences. Or were the Zimmermans just looking (like the Studebaker brothers) for new opportunities to apply their body building skills to? Ariejan, All very good questions but info on them is limited. Perhaps a reader will come forward with more info. They made De Sotos too? So DeSotos were made first by Zimmerman and later by Chrysler? From what we were able to find out that was apparently the case. Both appear to be named after Hernando de Soto the Spanish explorer and conquistador. I don’t think there was any connection between these two cars. Even the name was spelled differently: de Soto against DeSoto (check http://www.earlyamericanautomobiles.com/advertising7.htm for a 1913 ad). This ad is the only picture I could find of a de Soto, and although it is not very clear, it has in my opinion also Auburn features. Thanks for checking all of that out. I am hoping you get notifications from this board! Your conversation was so long ago- I live in the Franklin T. Zimmerman house in Auburn. I am always looking for info on the family/autos and I have never known anyone who owned one of the cars! Do you still? Are you still restoring? I bought a 1909 Model H Zimmerman two and a half years ago. I would like all of the information that I can find on the cars and history of the company and family. I have visited Auburn several times, and a year ago we had our annual Mitchell Club meeting at the ACD Museum. My father’s cousin was a Zimmerman as well as either his mother or grandmother. I grew up in Amherst ,Ohio where the whole family went back to the 1880’s. Another cousin that was a contemporary of my Father found the connection to the Zimmerman family and car in Auburn. It was nice to see a picture of one of the autos.